Popsicles in My Way | OccasionalPiece--Quilt! Posted on August 30, 2015 by Elizabeth E.
This morning, I drove the car down to our local park, walked one mile with my husband by my side, and drove home. Not a big deal for most people, but it was the first time I’d driven a round trip and walked that far in one swoop since the surgery nearly five weeks ago. Maybe all the post-surgery obstacles are now, after five weeks, becoming more like popsicles: little humps of fun to celebrate with song and a leap into the old swimming hole. So even though this feels like a lost summer, this past week I had another first: I operated my sewing machine, sewing up the Bee blocks for Mary’s turn at bat. And the world didn’t end. Tutorial is *here* or you can find it on the tab above under Tutorials, where I keep links to all of the tutorials on this blog. 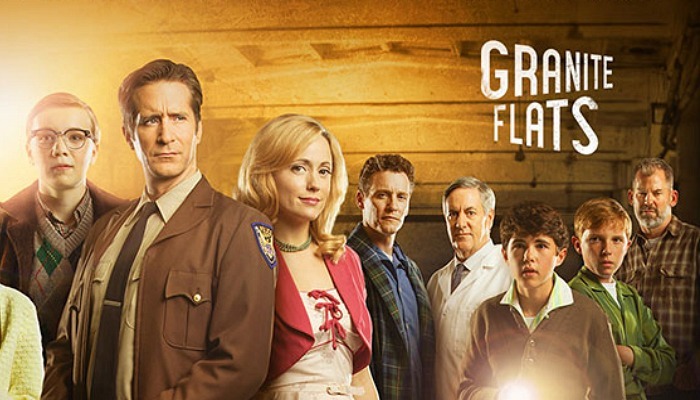 We’ve watched nearly all three seasons of Granite Flats (only 2 more episodes to go) and I’m continually amazed at how much freedom children in the sixties were given to roam around on their bikes and get into scrapes and generally explore. While it can be at times cheesy, it’s a fun show that has allowed me to sit and stitch, fully entertained. Earlier I was able, over the course of several days, to put this together on my pin wall, then went to bed for nearly two days to recover, paying for my creative burst of energy. During recovery I was confining my sewing to handwork, and was hoping to get this stitched up for the Kaffe Mini Swap I’m in, but I saw the writing on the wall, and switched to a different project that involved the sewing machine. I was able to put this one on the wall (only took two days this time), and will now tweak it and stitch it together and quilt it–all tasks that will probably take me oodles longer than usual. (Working title: Kaffe’s Rainbow Block.) But that is the good news! That I am actually quilting, working with the cloth, however slowly, and participating once again. Little steps, but definitely progress. 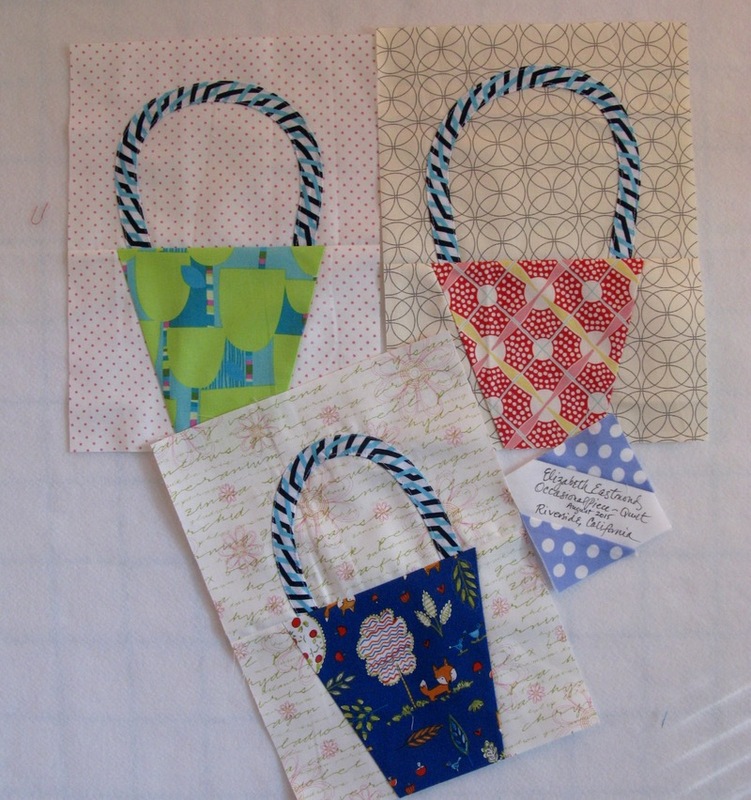 Hi Elizabeth – So glad to hear from you once again – Love all your quilting posts and hearing all about your goings on in your busy life. 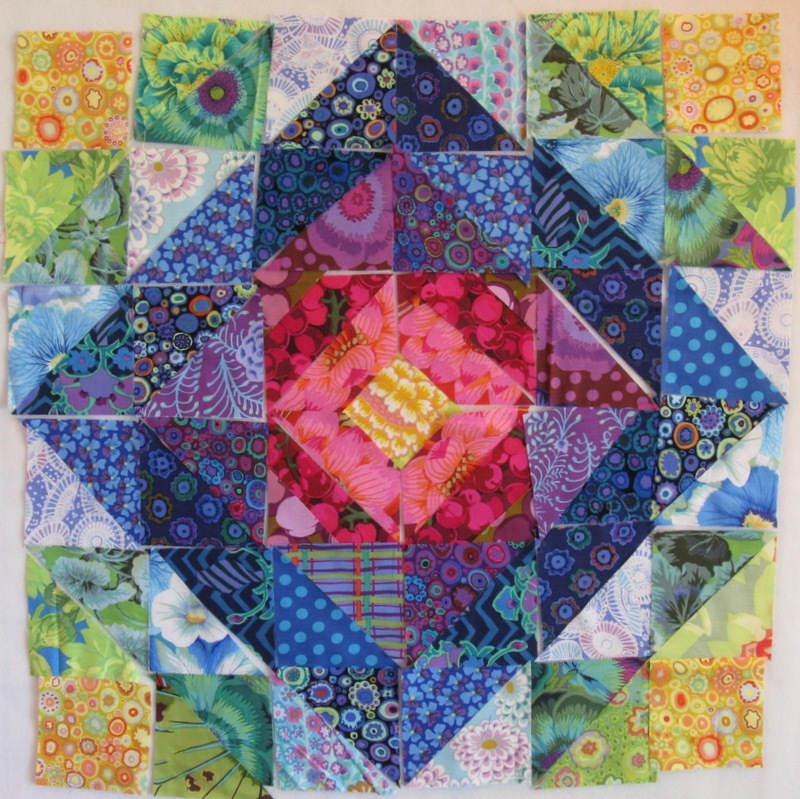 Being a Kaffe Fassett lover your new quilt is lovely. The colors are so pretty. Using his fabric make the very simple so beautiful. Thanks for sharing. You showed me a way I can use all the fabric I love and makes me think of my life for now. Still hope. Yeah for the incredible progress! We tend to take our daily routines for granted and are suddenly awakened when we discover our limitations. I’m so glad to read that you are progressing well at this point. I have loved these blocks on IG. The second one looked 3-D on IG. Both are just glorious in those fabrics. I call that great progress – driving and a mile walk! Hope it was early in the morning to avoid the heat. I’m still waiting for the cool down. All three of your projects are lovely and vibrant. Thanks for the tutorial, Elizabeth. 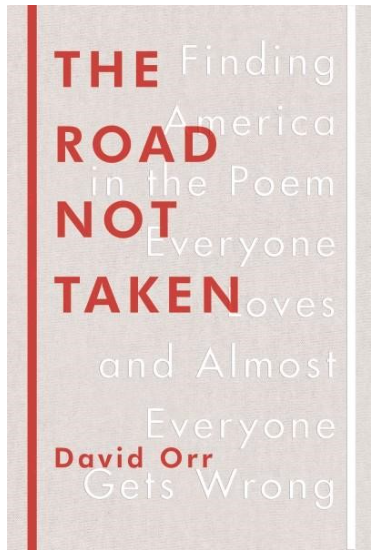 I’ve always liked that poem about choices – at least that’s what it means to me – I usually don’t discover the same meaning as others – poetry is so subjective. Prayers continue. of the brilliant fabrics. Thank you. I’m loving watching these colourful blocks. Glad that you are finding some energy. Onwards and upwards! As a child of the sixties I can remember our group of neighbourhood children walking everywhere (if we wanted a bike we had to save up for it ourselves) we used to roam for miles, down to the beaches, up to the farms, we had so much fun, so long as we were home by the evening meal, our parents weren’t concerned. I think it was quite a different time back then. I shall have to look for a dvd set of Granite Flats, it sounds quite entertaining. The recovery process from your surgery is happening in leaps and bounds, it won’t be too long before you are at 100% again. Blessings on you Elizabeth. Praying for a speedy recovery for you. So glad to hear of your monumental progress in recovery. And if I could enlarge this smiley face to fit your entire page, I would. Love that cartoon! And thanks for the movie peek. I’ve never heard of this one, so I’ll see if I can find it. You’ve been living life from a different perspective, that’s for sure. I didn’t go through even half as much with breast cancer. I’m definitely sorry for the worry you went through, and even sorrier about so-called friends who didn’t take the time to check on you post-surgery. I’m afraid I’m often guilty of neglecting friends, and sure can’t rationalize why I expect others to treat ME kindly when I don’t treat them kindly when it’s needed! It’s good to know you’re sewing a little, though I understand the frustration in wanting to do… and then tiring out before it’s done. 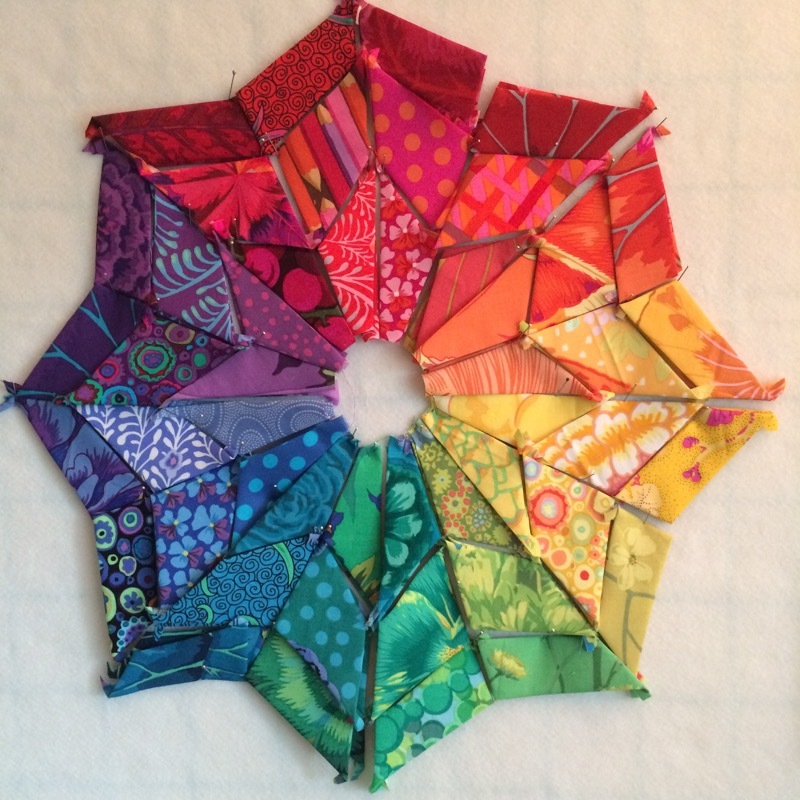 Your Kaffe’s Rainbow Block is super (but then your EPPed one is too!) and I hope you manage to get it finished as you want. But if you don’t, you have a perfect excuse for being a little late. (That “obligation” in swaps is one of the big reasons I never join them.) Now, get good news about those lung spots, and keep hanging’ in there. I love your colors–so vibrant and complex–like life, with a bit of uncertainty thrown in, right? The book looks good. I expect a full review when you are done. Glad to hear that you are back among the “living” (and by that I mean able to quilt a little), and seeing a light at the end of the tunnel that is NOT the headlight of an oncoming train! 😎 Remember, baby steps! Robert Frost is my all time favorite poet 🙂 I’ll have to give that book a look see! I’m so very heartened to hear you’re taking it slowly and enjoying yourself while you recover. Your blocks are just stunning! In a few months, when your to do list is miles long and you’re going fast fast fast, I wonder if you’ll look back on this time with a little sigh? I hope you’re free from pain, now! I think you need to have a daquiri popsicle for me!! XO! I got such a kick out of the cartoon strip! I’m having fun catching up on your posts. Keep up the good work with those popsicles! I also had flashbacks of me nursing my way through the entire 7 seasons of Gilmore Girls after having baby #2, haha.